Seven years ago, NBC aired Celebrity Family Feud as a half-hour series and it was cancelled after one season. Now, ABC has revived it in an hour format. Will the ratings be twice as good or bad? Will it be renewed for a second season on ABC or will it be cancelled? Stay tuned. On Celebrity Family Feud, celebrities and their family and friends compete to win up to $25,000 for charity by trying to guess the most popular answers to opinion questions. Steve Harvey hosts. This season, the celebrity players include Dr. Phil McGraw, Garry Marshall, Penny Marshall, Kevin McHale, Fred Willard, Toni Braxton, Anthony Anderson, Joey Lawrence, Mario Lopez, Ed Asner, and Vicki Lawrence. 7/27 update: You can see the latest night’s ratings in context. What do you think? 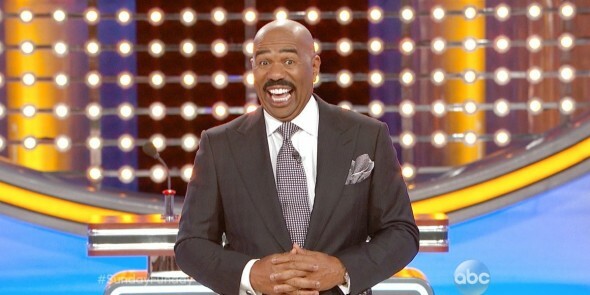 Do you like the Celebrity Family Feud TV series? Do you think it should be cancelled or renewed for a second season on ABC? I could care less about watching celebrities on any show. Most are washed up wannabes anyway.